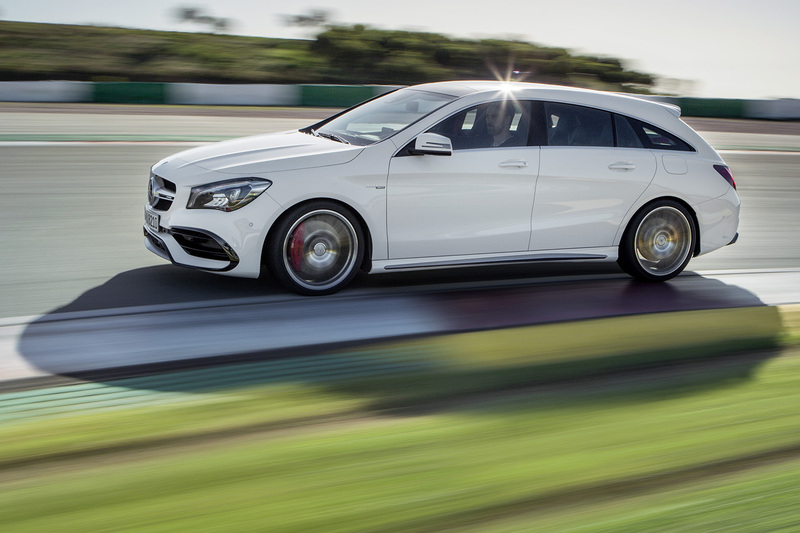 Mercedes-Benz has shown the facelifted CLA and CLA Shooting Brake at the New York motor show. The mid-life changes to the CLA and CLA Shooting Brake are predictably subtle, extending to mild exterior styling tweaks, revised interior trims, updated connectivity options and a wider range of engine choices. These include an updated version of the range-topping CLA 45 4Matic’s turbocharged 2.0-litre four-cylinder petrol engine delivering an added 21bhp at 376bhp. The 2016-model-year CLA is visually different from the existing three-year-old model by a new grille insert featuring diamond-shaped elements and a re-profiled front bumper with either a silver, black or chrome highlight. The rear-end styling has also been lightly updated with a new trim strip between the tailpipes, which are now integrated into the rear bumper. Buyers have the choice of optional LED headlights, a hands-free opening function for the boot (CLA saloon) or tailgate (CLA Shooting Brake), five different optional 18in alloy wheel designs as well as a new blue metallic exterior colour. The CLS sold on its exclusivity. Can the Mercedes CLA pull the same trick - or do its A-Class underpinnings hold it back? Inside, the CLA receives revised instruments with red needles, a new range of seat upholstery, updated trim elements and the chrome plated controls introduced to the facelifted A-Class in 2015. The optional 8.0in infotainment screen has also been enhanced with what Mercedes describes as a “slimmer appearance”. The CLA also receives enhanced smartphone integration via Apple’s CarPlay and Google’s Android Auto as part of its extensive list of options. This allows selected functions to be operated via the steering wheel or head unit controls. Also available is a new Universal Telephony option that includes a universal smartphone cradle and two charging cables with lightning or micro USB connectors. New to the line-up is the four-wheel drive CLA 220 4Matic and CLA 180 Shooting Brake – the latter running a Renault-sourced turbocharged 1.6-litre four-cylinder petrol engine producing 120bhp. The economy leader of the facelifted CLA line-up remains the 107bhp turbocharged 1.5-litre four-cylinder petrol powered CLA 180 d BlueEfficiency. It now delivers claimed combined cycle consumption of 80.7mpg and average CO2 emissions of 89g/km in saloon guise. 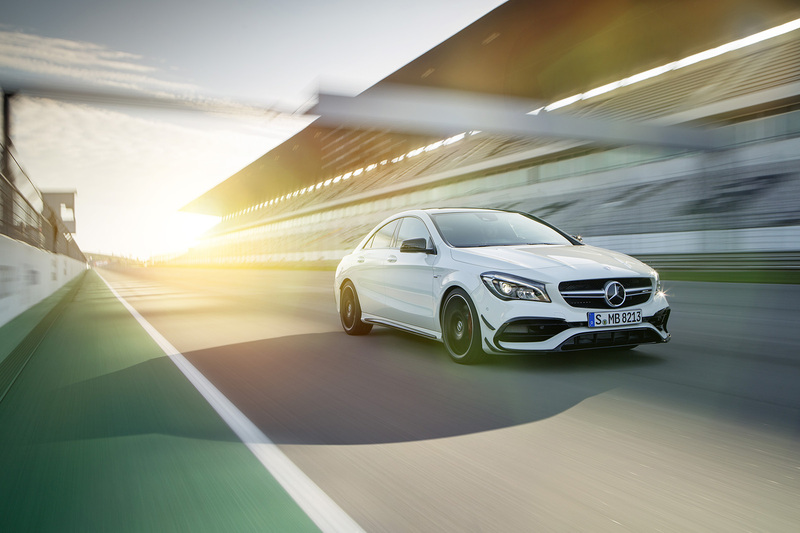 The four-wheel drive CLA 45 4-matic continues as the performance champion. With 376bhp, the AMG-engineered saloon and estate have a claimed 0-62mph time of just 4.2sec and 4.3sec respectively, beating their direct predecessors by 0.4sec respectively. As before, their top speed is limited to 155mph. That shooting brake is more long hatch-back than estate. This is the facelift for what will be the 2017 model, not 2016 - and the CLA45 already got the 376bhp/475NM engine for 2016. As with a lot of Mercs these days, not something you could call pretty but I guess their mother would love them. The problem I have always had with the CLA is that its proportions are all wrong, its simply too narrow. In a way it reminds me of the Skoda Rapid in that you see one in your rear view mirror and for a second wonder if your rear view has been swapped out for some convex wide angle mirror that squashes everything. I agree. And it's not helped by the fact that Merc's saloon design, suited to its rear-drive cars, has been transplanted on to its FWD platform, resulting in very odd proportions especially when viewed from the side. Mercedes certainly has two design approaches; restrained for its traditional and larger models and just plain garish and fussy for the models it aims towards a younger audience. A-Class, CLA, GLE, SLK, they all look quite ghastly and tacky. Mid-life improvements are necessary for a brand to shine amongst the crowd. If its range of models remains stagnant in terms of performance or quality wise, the attraction factor will gradually begin to fade which will in turn lose customers’ interests. Regardless of how subtle the changes are, they are still highly essential to progress forward though in a slow pace.